The Conservatives’ changes to electoral registration will disproportionately remove people from the electoral register in poorer areas of the country, an analysis suggested. Over twice as many voters will be removed from the register in the ten poorest areas in the UK compared to the richest areas outside London. The capital, a Labour stronghold, will also be disproportionately affected by the shift to Individual Electoral Registration (IER), because of the high proportion of people who live in private rented housing there. The Government is moving Britain’s electoral register from a system of household electoral registration to an individual one. But groups, including the Electoral Reform Society and Hope Not Hate, have warned that the way the change is being made could lead to underrepresentation in poorer areas. Most people have been automatically moved over to the new register by matching their data to other government services, but in deprived areas the proportion of people found is significantly lower - meaning more entries are simply taken off the register. In Britain’s ten poorest areas an average of 6.2 per cent of people on the electoral register are expected to be removed when the system changes – with the figure as high as 22.9 per cent in areas like Hackney where people who rent their homes live. By comparison only 2.96 per cent of voters will fall off the register in the ten leafiest and richest areas outside the capital, the study, conducted by Hope Not Hate, found. Most worryingly, underrepresentation now could be made permanent because the new boundaries for parliamentary constituencies will be decided on the electoral register as it stands on 1 December 2015. The Government wants to base the new boundaries – which are expected to favour the Conservatives – on registered voters rather than actual population levels. This means that missing voters in poorer areas – usually safe Labour – could lead to entire constituencies disappearing and reappearing in rich areas – usually safe Conservative. This would shore up the in-built advantage the Conservatives have under the current electoral system. The Labour-facing campaign group Momentum announced on Sunday it was launching a mass voter registration campaign to try and sign as many people up to the register before 1 December so that the boundary review would reflect the population as accurately as possible. The campaign is supported the TSSA, a railway workers’ union. Sam Tarry, the union’s national political officer, described the boundary review as a stitch-up. “The Tories want to gerrymander the electoral boundaries - taking away millions of working people across Britain’s chance to be counted,” he said. “It's a blatant, anti-democratic stitch-up designed to keep them in power for as long as possible. Katie Ghose, the chief executive of the Electoral Reform Society, said the Government’s move was a “worrying issue for our democracy”. “The fact that 1.9 million people risk being excluded by the government’s wrong-headed early shift to complete individual voter registration – against Electoral Commission advice – is a scandal. We should be looking at automatic registration, as happens in many other countries - otherwise millions of people could lose their voice,” she told the Independent. “The government appear to be prioritising cutting the number of MPs while continuing to allow the Lords to grow out of all proportion – a seriously worrying issue for our democracy. The Government defended the early switch to the new register and said it believed enough people had signed up for it to be viable. Officials also point out that some people not covered by the new IER list may be data errors rather than real people still living at that address. The Cabinet Office said it would work with local authorities to make sure as many people were registered as possible and added that individual voter registration was a vital reform to Britain's political system. “Individual electoral registration is absolutely key to tackle election fraud. We are working with local authorities to remove ghost voters who don’t exist or have moved on, to make sure we have a clean and fair electoral roll. " John Penrose, Minister for the Constitution, said. “This system has been tried and tested in Northern Ireland for over a decade, where there were once serious concerns about electoral fraud. “The answer to under-registered groups like young people or expatriates is not to stuff the electoral rolls - and potentially the ballot boxes - with the names of people who don't exist, but instead to run a vigorous and energetic voter registration campaign. Which we will do." The boundary review was due to go ahead before the 2010 general election but was blocked by the Liberal Democrats in response to Conservative MPs blocking House of Lords reform. She has been awarded an OBE (Officer of the Order of the British Empire) - the next most prestigious award after the CBE - presumably due to her role as a long-serving party organiser based at head office with the title 'campaign specialist'. ...Channel 4 News has also obtained evidence linking the operation on the ground to senior figures in the Campaigning Department of Conservative Campaign Headquarters (CCHQ). Rooms at the Rock hotel were apparently paid for personally by senior Campaign Specialist Marion Little, taking the number of hotel rooms that were booked in either Ms Little's name or using her home address in Hertfordshire, or paid by her, to 770 across the three by-election campaigns. New emails show further involvement by Ms Little, who appears to have a direct role in organising the Clacton campaign, and in closing down campaign centres known as "bunkers", before moving the operation south of the River Medway to the Rochester & Strood by-election the following month. In an email Ms Little wrote: "The Helium canister needs to come to the Bunker so we can get it to Rochester. "ALL THIS KIT IS BEING COLLECTED AT 7AM FOR ONWARD TRANSMISSION TO ROCHESTER. "Finally, and most importantly THANK YOU - I look forward to seeing you all south of the river." She was put up for two nights in the town's Premier Inn - nights that do not appear on the official declarations. Ms Woodland said: "I would say, based on the evidence I've seen, the fact that it happened in three by-elections, one after the other, it's systematic. "And they know the law. They've been running elections for years. "To do it three in a row, and to do it pretty big in a couple of places means there was full intention behind it. "If they'd gone over by a couple of rooms because they miscalculated, you know £30 or £40 accidentally, that's different. Amid the actors, athletes and other famous figures rewarded in the 2016 New Year Honours list, there was a name unfamiliar to all but a few Westminster insiders. It was that of Marion Little. She was described in the official London Gazette announcement as 'Campaign Specialist, Conservative party'. She was to be made an Officer Order of the British Empire. She had earned it for unspecified 'political service'. 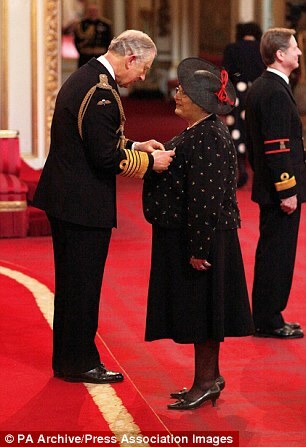 At Buckingham Palace on February 24, Mrs Little duly received her gong from the Prince of Wales. But how exactly did she earn her OBE? It is a question of considerable interest. And, in some quarters, of growing concern. Amid little fanfare, the Electoral Commission — Britain's independent but largely toothless election watchdog — announced last week that it was expanding an investigation into Conservative Party election expenditure. It was already looking at the Thanet South constituency in last May's general election. Now it was to further examine spending returns at three by-elections in 2014. Under the Representation of the People Act 1983, a candidate's expenditure limit in a by-election is £100,000 — and considerably lower in a general election. Nothing spent fighting a seat can be kept from public scrutiny, from the most insignificant paper clip to use of a private jet. Nothing can be provided to a campaign for free; everything has to be given a 'notional value' as if it had been paid for on the commercial market. Notional and actual expenditure are added together and the total has to be within the limit. It goes to the very heart of modern British democracy that elections should not be 'bought' by the richest candidate or party. And yet an investigation by the Daily Mail and Channel 4 News has uncovered what appears to be significant undeclared expenditure by the Tories in key constituency battles; tens of thousands of pounds spent almost exclusively on hotel rooms for electioneering experts parachuted in by Conservative Party headquarters in London. Crucially, had that expenditure been fully declared, it would have taken the local candidates' spending way beyond the legal limit. Among the apparently undeclared bills and invoices obtained by this newspaper one finds the names of some of David Cameron's most trusted advisers and his party's most senior back-room fixers. They include Stephen Gilbert, the party's deputy chairman until he stepped down in November following criticism of his close links to the campaign to keep Britain in the European Union. Also involved is Andrew Feldman, the Tory co-chair and principal party fund raiser, who is named on a (declared) invoice in one of the by-elections under scrutiny. He is Mr Cameron's long-time friend, with whom he plays tennis. Although unelected, the PM gave his Oxford University pal a peerage after the 2010 election. Both Gilbert and Feldman were ennobled for their services to the Tory Party. What did they know about the apparent non-declaration of funds? The period under scrutiny was one of do-or-die desperation for the Cameroon Tories. Opinion polls showed Nigel Farage's UKIP was on the march in Tory heartlands. Two Tory MPs were about to defect. A no-holds-barred response was needed or power might slip away. Enter Mrs Little, a 61-year-old mother-of-two from Ware, Herts, who's been working on campaigns for the Tories for almost 20 years. It is a perhaps apocryphal story in Tory circles that her party credit card has a spending limit even higher than that of the chief moneyman, Lord Feldman. True or not, Mrs Little appears to have used it to book hundreds of election-time hotel rooms which subsequently went undeclared. On June 5, 2014, a by-election was held in Newark, Notts, following the resignation of Tory MP Patrick Mercer. The poll was seen as a litmus test for the growing UKIP threat to Tory chances of winning the general election 11 months away. Mrs Little and other Westminster-based campaigners were told to pull out all the stops. Hotel receipts and invoices seen by the Mail reveal how very important the Newark poll was to them. During May and the first week of June, members of the Tory HQ election team stayed a total of 59 nights at a cost of £4,209 at the Kelham House Country Manor near Newark. Most of the bookings were made under Mrs Little's name, but the names of other senior figures are also on the bills. The then Political Secretary at No 10, Stephen Gilbert, seems to have spent four nights at the manor. There he enjoyed burgers, pies and T-bone steak and chips. 'Political adviser' Simon Glasson showed more metropolitan tastes (asparagus and brie rarebit and Devon crab brulee), while Mrs Little ordered Guinness and fish and chips. The names of by-election specialist Richard Piper-Griffiths and deputy Head of Press Richard Holden also appear on the Kelham House Tory room receipts. Not everyone could stay in such luxury every night. Receipts and invoices for the Premier Inn, Newark, obtained by the Mail, show that the Tories booked rooms to a total of 125 nights during the election period, at a cost of £6,250. The names of Mrs Little and Messrs Holden, Glasson and Piper-Griffiths also appear on these bills. All this effort was to pay off. The Tories retained the seat. The victorious candidate, Robert Jenrick, and his agent Stuart Wallace later submitted Mr Jenrick's declared election expenditure as being 'complete and accurate … as required by law'. The total came to £96,190 — just under the £100,000 legal limit. Like the other constituencies we have looked at, almost all the money came as declared donations from Conservative Campaign HQ. A notional £11,140 was declared for the rent of the campaign HQ. But there is no sign of the more than £10,000 spent on the two hotels for Mrs Little's election 'hit team'. If that amount had been included, it would have taken the Tory spending in Newark several thousand pounds over the legal limit. A spokeswoman for Mr Jenrick said it was a matter for the national Tory Party rather than him. Mr Wallace did not respond to enquiries. A pattern was being set. The next crucial Tory-UKIP by-election face off took place four months later in the Essex seaside constituency of Clacton. The poll was called after the defection to UKIP of sitting Tory MP Douglas Carswell. Once again, Mrs Little and her team went into overdrive. As in Newark, the visiting Tory election specialists would have two tiers of local accommodation. The Lifehouse hotel and spa at Thorpe-le-Soken was the luxury option. Receipts seen by the Mail show that a Mrs Marion Little booked rooms for Conservative Party workers for a total of 258 nights at a cost of £20,640. The names of Mr Piper-Griffiths, Mr Holden and Mr Glasson once again appear on the bills. The latter seems to have stayed 32 nights. Victoria Goff, the Tory election agent, spent a total of 28 nights at the Lifehouse. Her home was in Chelmsford, a 40-mile drive away. Meanwhile the foot soldiers were found space at Clacton's Premier Inn. Receipts and invoices show a total of 68 nights were booked at a cost of £6,146. In other words, Mrs Little's team would be parachuted into the Rochester and Strood constituency to take on Mark Reckless, another Tory MP defector to UKIP for another by-election due on November 20. The Clacton poll was confirmed as a Conservative humiliation, as the party finished a distant second to UKIP's Carswell. A month later the Tory election expenses returns were signed off by the defeated Giles Watling and his agent, Victoria Goff. Their declared spending was £84,049 — well inside the £100,000 legal limit. One of the biggest individual items of expenditure for which a receipt was declared was the £5,640 spent on hiring a helicopter to fly Prime Minister David Cameron from London to Clacton for a 'last ditch' attempt to save the day. We can also see Mrs Little's name on an invoice for a printing firm which produced campaign literature. But there was no mention of the rooms taken at the Lifehouse spa or the Premier Inn. This is odd — not least because, as we have seen, Miss Goff apparently spent 28 nights at the Lifehouse. If the cost of these rooms had been included, the total would have gone more than £10,000 over the legal limit. How can this be explained? Mrs Little, Mr Watling and Miss Goff all failed to respond to our enquiries.By now familiar Tory faces moved on to battle UKIP in Rochester. This time, Bridgewood Manor, a country house hotel near Chatham, was chosen as base for the Westminster Tory election fighters. Hotel receipts show the Tories booked a total of 446 nights at a cost of £38,112. Mr Holden, Mr Piper-Griffiths and Mr Gilbert all appear on these hotel invoices. What of Mrs Little's foot soldiers? Hotel room bills for the Premier Inn in Rochester show that a total of 226 nights were booked for the period of the by-election under the name 'Conservative and Unionist Party.' Three of the rooms were booked solidly for a month. The address given for all the bookings was Mrs Little's home in Hertfordshire. The total spend on these rooms was almost £19,000. Again, all their efforts were to no avail. UKIP's Mark Reckless held the seat against Tory candidate Kelly Tolhurst. The latter, along with her agent Julian Walden, signed off her declared election expenses one month later. They came in at £96,793 — just under the legal limit. The name of Andrew Feldman appears on one declared invoice. It was he who had commissioned local election research costing £4,500. But of the hundreds of hotel nights, valued at £56,866.75, there is no sign. If they had been included, it would have taken the Tory election spending over the legal limit by more than half as much again. How to explain this? Neither Mrs Tolhurst nor Mr Walden responded to enquiries. The general election took place on May 7, 2015. UKIP leader Nigel Farage stood in Tory-held Thanet South and had high hopes of a win. But the Cameroon Tories were not giving up. In fact they planned a decapitation strategy. If they stopped Farage, it would be a mortal blow to their main rivals in the Tory heartlands. They succeeded. Although the Tory vote dwindled, candidate Craig Mackinlay beat Farage into second place by 2,800 votes. The following month, Mackinlay and his agent Nathan Gray signed off their election expenditure. In the final month he had spent a declared £14,837 against a legal limit for the period of £15,016. One of the largest declared items was the hire of a hall to host visiting Chancellor George Osborne in election week. There was even an invoice for £25 for the hire of a tandem for a PR stunt. No hotel bills for local electioneering accommodation were entered. In January, the Electoral Commission published campaign expenditure returns of the main political parties at the 2015 Election. Among the Tory Party's declared 'national spending' — as opposed to local candidate electioneering expenses — there were several bills for the Royal Harbour hotel in Ramsgate, at the heart of the Thanet South constituency. The receipts showed that a total of 95 individual nights had been booked there by the Tories during the election campaign at a cost of more than £14,000. Mrs Little is known to have stayed. As the national spending limit for each party at a general election is £19 million, this amount was a drop in the ocean. But that £14,000 would not have been a small sum if included — as it almost certainly should have been — in Mr Mackinlay's candidate expenditure. In fact, by itself the hotel bills would have swallowed up his entire legal amount. Why was the Royal Harbour placed in national spending? Were the Tories really running their national campaign from Ramsgate? Last night, new evidence of alleged undeclared spending in South Thanet was emerging. The Mail understands that some 40 activists were bussed into the constituency on April 11, 2015, and put up overnight in a hostel in Margate. This does not seem to appear on public records. And last night a Party spokesman told the Mail: 'All local spending has been correctly declared in line with the requirements of the Representation of the People Act. And yet the evidence suggests that hotel expenditures for crucial elections have indeed been hidden. The problem for the Electoral Commission is that its powers are limited. It can investigate and admonish but it cannot prosecute. That is a matter for the police. However, disturbingly, in the case of the three by-elections, it is already too late because the 12-month time limit for investigation under the Representation of the People Act has expired. Meanwhile those who appeared repeatedly on the missing hotel receipts have largely prospered. Stephen Gilbert, the Tories' director of campaigning for the 2015 election, was elevated to the peerage as Baron Gilbert of Panteg. He now works part-time for the firm Populus, which is providing polling, research and focus groups for the EU Remain campaign. Richard Holden is now a special adviser to Baroness Stowell, Tory Leader in the Lords. Political adviser Simon Glasson is now a special adviser to George Osborne. Victoria Goff is the Head of Local Government at Tory HQ. Kelly Tolhurst, defeated in the Rochester by-election, stood again and won at the general election. And Mrs Little got her gong. Though no one is prepared to say why — or explain the discrepancies in legal and illegal spending in those vital by-elections. 1. Why were the 734 nights of hotel accommodation which were paid for in her own name by party official Marion Little not submitted to the Electoral Commission? 2. Was Lord Feldman aware of arrangements to provide hotel rooms to election campaign workers? 3. If so, was he told of the plan to pay for much of this accommodation through Marion Little's own credit card? 4. Was Mrs Little subsequently repaid by the party HQ? 5. If she was repaid, who authorised these paymens?